Borage Oil by Barlean's Organic Oils is an all natural, certified organic oil supplement that's teaming with good omega 6s. 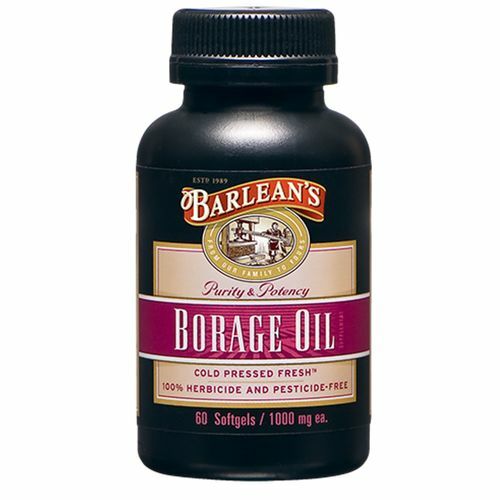 And because Borage Oil is made by Barlean's, you know it's not just another borage oil supplement. This stuff is made from organic crops that are 100 percent herbicide and pesticide free. It's cold pressed to secure maximum nutritional value, unfiltered and unrefined. Borage Oil is the perfect supplement for women, men, the elderly and the youthful. Order your bottle of Borage Oil from eVitamins today and see what Barlean's can do for you. Recomendações de uso: 1-2 Softgels a day, with or without meals.